Fitting, of course -- given that there's a certain film out there right now making quite the killing (literally) in theaters thanks to Blumhouse and company, including one Jamie Lee Curtis returning to the iconic role that began the scream queen phenomenon. 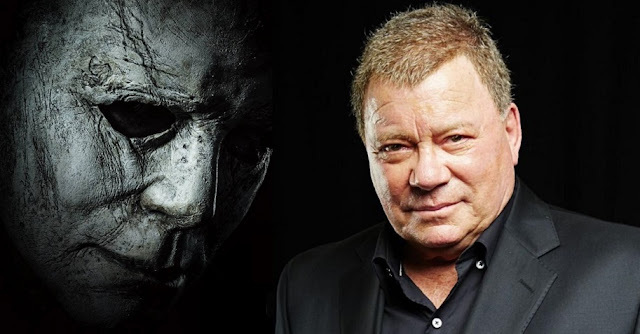 But you wouldn't have guessed that indeed there was another iconic star returning to that infamous slasher story from long ago, and he is a man who has boldly gone where no one has gone before. William Shatner. That's right. He actually was in the new HALLOWEEN film (sort of). They brought back the original William Shatner mask from the 1979 film that started the horror of Halloween. If you saw the chilling new sequel already, you were then witness to the mask. That mask, of course, hath been through Hell (literally) all of those years, without a doubt. Now I know, I know -- William Shatner was technically NOT in the film. His likeness was. That, of course, didn't stop Captain Kirk from poking fun and making it awesome on one Halloween night trick-or-treating with his kids -- wearing the mask! Talk about strangely existential.... Shatner wearing his own face over his...face. The story came about during an interview with EW about the incredible returns of HALLOWEEN, knowing that none of that would've come to fruition had it not been for the man's likeness featured and sold in costume stores nationwide. Was Shatner perturbed about the fact that he received literally no credit over it? Of course not! Love it. That sounds like a Star Trek captain with an awesome sense of humor, and my kind of guy. Come on, Blumhouse and John Carpenter, Give the Man Some Credit, Will You? The dude truly deserves it. Well, not like he needs it. The guy's explored strange new worlds and sought out new life and new civilizations for much, much longer. Let's hope Michael Myers doesn't start going after him since Jamie Lee Curtis ain't havin' none of that.